I recently had the opportunity to visit Tory Island, off the northwest coast of Ireland, nine miles out into the Atlantic Ocean off Donegal. 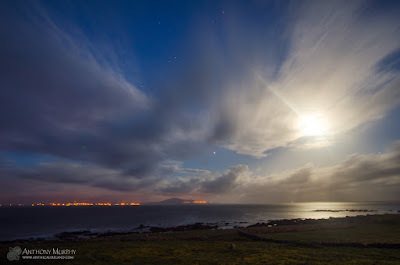 Being acutely aware that the island is known in myth as the stronghold of the Fomorians, those dark, brooding forces of evil that sought to suppress and vanquish the Tuatha Dé Danann, I somehow felt that I should gird myself for the journey. Shortly before I went to Tory, I visited Newgrange, where I hoped that, in some way, the Dé Dananns would make their presence felt in my own mental being - that, somehow, I would be imbued with some supernatural psychological strength to repel any of that dark energy that might perhaps lurk on this mysterious island out in the ocean. The rationalist in me balked at the whole idea. Supernatural forces indeed. What a load of nonsense. However, at Newgrange I had a strangely unique experience. The place seemed bereft of presence. It felt bizarrely devoid of any energy or power. It had become, for the first time in my experience, just a heap of stones. Under the stars in the summer twilight, I felt very alone. What was happening? This self portrait was taken at Newgrange on the night in question. Upon reflection, it now seems clear that the perceived absence of energy at Newgrange was the unconscious realisation within myself of a distinct lack of presupposed personal energy of any form - good or bad, Dé Danann or Fomorian - that I might have used in my own imagined battle with the Fomorians out on Tory. In other words, while I went to Newgrange to mentally prepare for the trip to Tory, where I feared I might encounter a darkness in my own nature, when I got to Newgrange and found it bereft of vitality, I should have realised that this was a blunt message from within, which might have said something like "there is no need to gird yourself, because the only energy you will encounter on Tory is whatever energy you bring there yourself". 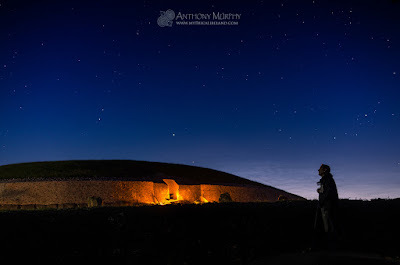 Through such experiences, we realise one of the great truths about sacred sites like Newgrange. And that is the idea that they are expressions of our own numen-seeking nature. They reflect back to us the energy that we bring to them. Newgrange is a place of peace and power because we make it so. Does this mean we only imagine that it has power, and that in fact, as many archaeologists have perhaps concluded, it is merely a man-made cairn of stones and nothing more? Does this mean it has no power at all? The answer to that question depends entirely on your own perception of it, and indeed your own general approach to such issues. For many of us, Newgrange has an intense power. The monument functions as a mandala of sorts. It activates for us great sources of awe and wonderment, of some deep bliss within us, or perhaps even a sense of our greater connection to the cosmos, and to forces of spiritual vitality and oneness that lie beyond rational explanation. It has this power because we allow ourselves to be open to the possibilities. How can we know whether any of this power with which we imbue it was an intention of the builders? We can't. And therefore we must allow it to be whatever it will be for each and every individual. And therein lies the true power of Newgrange. Arriving on Tory Island in June, coming towards midsummer and the longest days of the year, I can truly say that I was enchanted. It did not hold any sort of dark energy perceptible me, except for whatever feelings such a remote and windswept and barren piece of rock might instill in the human spirit. While I enjoyed my time there and really warmed to Tory, I can imagine that the picture must be much bleaker in winter time, when the island often becomes cut off from the mainland, sometimes for several weeks or even months. 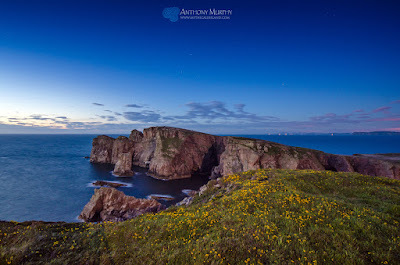 A view from Tory Island looking towards Donegal on the mainland. On most days, you can see the mainland, and the mountains of Donegal. But despite their relative proximity, there are times when they seem a lifetime's journey away. Tory is one of those unique places where it is possible to experience a sense of loneliness and detachment, in a way that visits to Newgrange cannot possibly do. Staying in the easternmost property on the island with a group of amateur radio friends gave me the opportunity to visit what is perhaps the single most powerful part of the island from the point of view of both mythology and dramatic landscape - Dún Bhalóir (Balor's Fort). This very striking promontory is the highest part of the 5km-long island, with dramatic precipitous cliffs that present almost-vertical drops to the surging Atlantic below. Over the course of five days on the island, I made many visits to Dún Bhalóir. The first was filled with some trepidation, as I am not blessed with a good head for heights! Despite my fear, I was captivated and enthralled by Balor's Fort, which is a fantastic example of an Iron Age promontory fort. There are dramatic views of the whole island from up there, and indeed the Atlantic Ocean. It was here that Balor had his stronghold, and in an a cleft on its eastern side, surrounded by high sea cliffs, was Príosún Bhaloir, into which he was said to have kept his prisoners. Was it here at Balor kept his daughter, Eithne, who would eventually become the mother of Lugh, the one who would kill Balor? Dún Bhalóir with its precipitous cliffs in the midnight twilight. I made repeated visits to Balor's Fort. It kept calling me back. This isolated spot, high on a rocky isthmus on this remote outpost of civilisation, had a power for me similar to Newgrange. It awakened within me some deep-seated sense of awe, and of rugged and raw isolation, such that it was possible, momentarily at least, to lose all sense of myself. Of course the camera was always on hand, and the nature of the sunsets and long drawn-out, everlasting twilight of June meant that the constantly-changing scene presented dramatic pictures that transformed from one moment to the next. Eithne's son Lugh built himself a fort called Dún Lúiche, at the base of mount Errigal on the mainland. It was here that Balor was said to have been killed by Lugh with the help of Gaibhdín Gabha, a Tuatha Dé Danann smith. They killed him by thrusting a red hot spear through the back of his head and out through his evil eye. Gleann Nimhe/Poison Glen is named from the liquid which poured from Balor's eye. "We must kill the evil eye within ourselves." 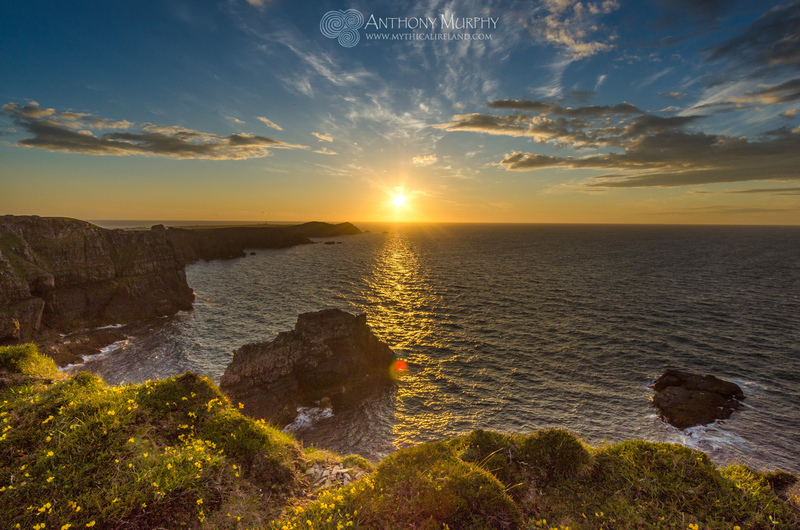 Sunset on Tory, captured from the cliff tops at Balor's Fort. Reflecting on the metaphor of the story of Balor's evil eye, and how he was killed by a spear or slingshot from Lugh, it became clear to me that what the evil eye represents is our own shadow, the dark aspects of ourselves which we might perhaps project onto others - in this case, these others are represented by Balor and the Fomorians. They are not some dark or evil race, some shadowy mythical beings. The Fomorians are our shadow. In the human lifetime, there is an everlasting conflict between the Tuatha Dé Danann and the Fomorians. This battle, or counter-positioning of the forces of light and darkness, is present to some extent in all of us. This problem of the evil eye - the eye that sees malevolence and misdeeds in others and perhaps wants to act upon this prejudice - is present in very destructive and threatening forms in the world today. This current manifestation of the evil eye in Europe and America in particular threatens to bring the world to a new conflict - a clash of civilisations akin to the great battles between the Tuatha Dé Danann and the Fomorians. We must not seek to kill the Fomorians. For one cannot kill one's own shadow. One must merely acknowledge its presence and, to an extent, "make friends with the devil". Jung might have referred to this as assimilation of the shadow. We should retain an awareness of our own shadow, but not identify with it. It is more important that we kill the evil eye, that prejudice within us that wants to blame others for the ills of the world. Let us pierce that evil eye with a great spear, or break it with a slingshot, so that the world of mankind does not bring itself towards a Third Battle of Moytura. This is a video of Newgrange in the evening time in summer. It's such a tranquil and beautiful place to spend time, as this video shows. Listen to the sounds of the birds and the animals and take yourself to this sacred spot overlooking the Boyne for a few minutes of bliss. It is strongly advised that you watch this short video in full screen mode in high definition and with either good speakers or headphones. Enjoy! Labels: animals, birds, Boyne, cairn, evening, megalithic, monument, mound, Neolithic, Newgrange, passage-tomb, sounds, Stone Age, summer, Valley. This is a segment from a half hour documentary about Newgrange Monument to Immortality author Anthony Murphy and his journey from being a newspaper journalist into writing books about the ancient monuments of the Boyne Valley. The film was made by local film maker Martin O'Donoghue. 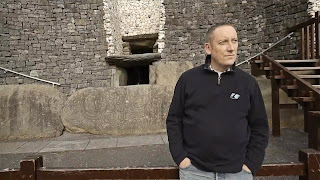 In this segment, Anthony talks about his many visits to Newgrange and discusses some of his personal insights into this ancient wonder. 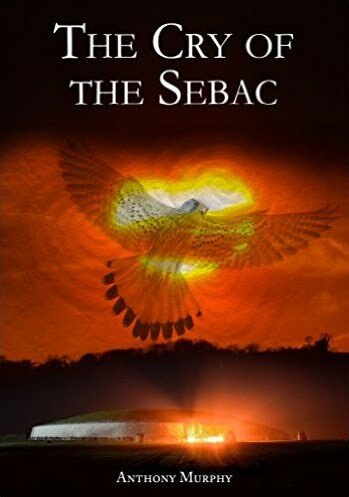 He talks in particular about how he wanted to write a book devoted to Newgrange, having included the monument as part of a wider look at the ancient landscape in his first work, Island of the Setting Sun. The project is a precursor to a much larger, full-length documentary film on the subject, exploring the meaning of Newgrange to people today. Planning for that larger film has begun. A screen shot from Above Below with Anthony Murphy. 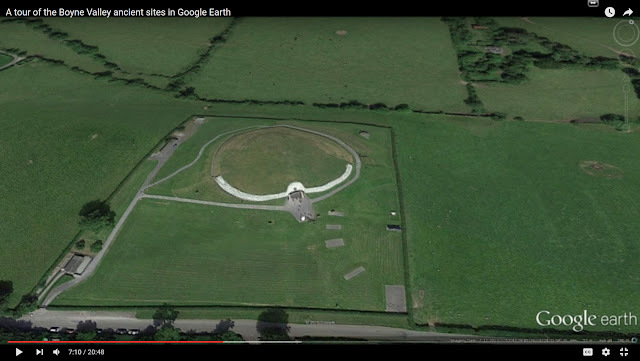 In this video, I take a look at the location of many of the major monuments of the Boyne Valley using Google Earth, a free program which is very useful to those researching the megalithic sites. 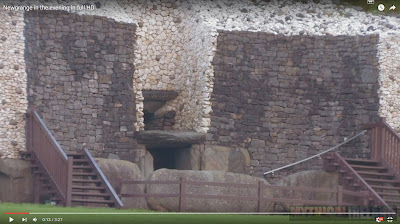 Google Earth has high-resolution satellite imagery of Ireland and in this video, we take a look at the situation of Newgrange, Knowth, Dowth, Tara, Slane, Millmount, and some of the other prehistoric sites of the Boyne region. 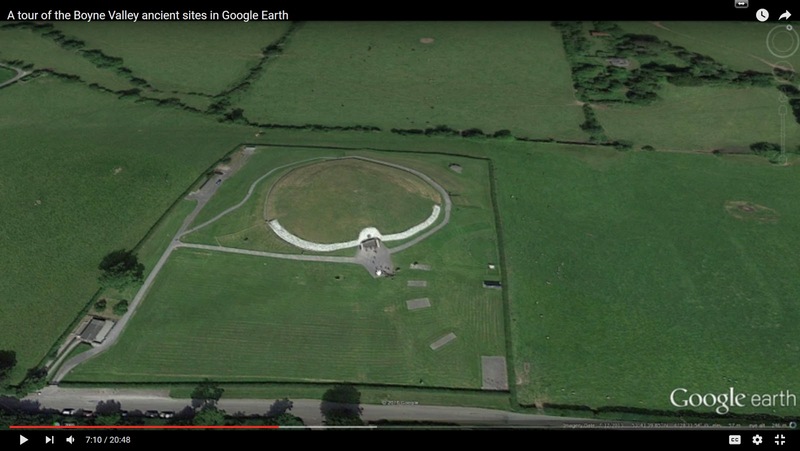 Those of you who don't live in Ireland can explore the ancient sites using Google Earth, taking a look at how they are located in the landscape. This video will give you a good idea of just how many sites can be seen, and also their position in the landscape and proximity to each other. There's some history too - such as the fact that Drogheda was once two towns, built on either side of the Boyne, and there's even a quick look at the place where the Boyne River is said to have its source.